The Bachelor of Midwifery programme at Bangor University has reached “Stage 1” of their journey towards achievement of UK UNICEF Baby Friendly Initiative (BFI) University accreditation. 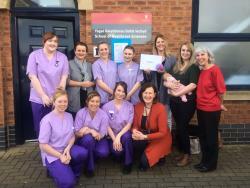 They are keen to be the first midwifery programme in Wales to achieve full accreditation. Currently, there are no other midwifery programmes in Wales that have reached full BFI accreditation with only 36% of midwifery programmes in the UK having reached full First and second year Student midwives, Sharon Breward, Infant feeding coordinator for BCUHB (in grey), Lynne Edgerton (in red) and Sheila Brown (in orange). accreditation. The UK BFI works to improve breastfeeding rates in the UK by assessing the quality of support and information women and their families receive during pregnancy and following birth. BFI University accreditation assess the quality of the education prospective health care professionals receive within University programmes, in relation to infant feeding. Students exiting BFI University accredited programmes do so with an additional certificate in breastfeeding support. In response to a recent series of articles in the Lancet highlighting the overwhelming evidence base that breastfeeding provides children with the best start in life, UNICEF is calling for action, at government level, to ensure that effective programmes to support breastfeeding are financed. This has the potential to significantly improve maternal and child health outcomes globally. In order to make an informed decision of how to feed their baby, it is imperative that women are aware of the significant impact that breastfeeding can have on the health of their newborn baby. If women choose to breastfeed, it is vitally important that they have the necessary support to do so successfully. According to a recent infant feeding survey in the UK, women who chose to breastfeed their baby at birth struggled to continue to breastfeed within the first few weeks. Women who gave up breastfeeding in the early weeks following birth reported that they would have liked to continue breastfeeding for longer. Midwives are best placed to offer support and guidance to women regarding infant feeding and therefore it is crucial that future midwives have sufficient knowledge and skills to support women to successfully breastfeed. BFI University Accreditation will ensure that student midwives will qualify with a firm foundation of evidence based knowledge in relation to breastfeeding. By ensuring that future midwives qualify with excellent knowledge and skills to support women to breastfeed, along with skills for life-long learning, the midwifery programme at Bangor University can make an important contribution to improving public health in Wales.